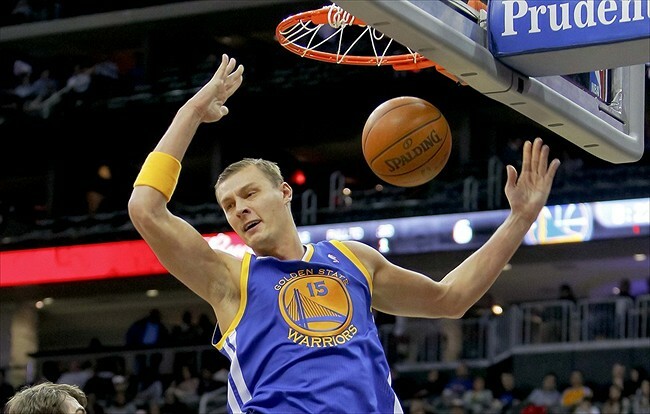 Golden State Warriors: Will Andris Biedrins Step Up Next Season? Andris Biedrins is quite the enigma. He went from being an intriguing young center to the last guy off the bench in a matter of a few seasons. He went through serious confidence issues, severe free throw struggles, and some nagging injuries. Biedrins’ history with the Golden State Warriors has been rocky, but he could have an opportunity to make an impact with the Warriors next season.Festus Ezeli underwent surgery on his right knee recently, and he is expected to miss 6-9 months. This past season, Andrew Bogut only played in 32 games during the regular season due to left ankle problems, so it’s not clear how healthy Bogut will be next season. 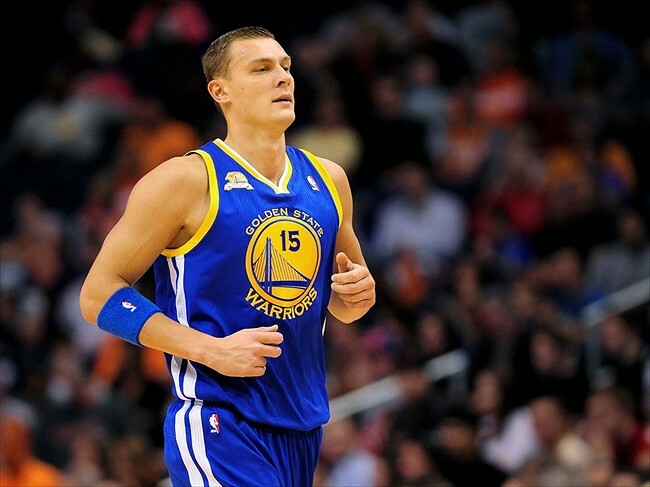 Given these uncertainties, Biedrins could play significant minutes for the Warriors. However, it’s not clear if he’ll rise to the occasion given his history with the Warriors. Jan. 2, 2012; Phoenix, AZ, USA; Golden State Warriors center Andris Biedrins (15) on the court against the Phoenix Suns at the US Airways Center. The Suns defeated the Warriors 102-91. Mandatory Credit: Jennifer Stewart-USA TODAY Sports. Biedrins started to show his potential during the 2006-2007 and 2007-2008 seasons. Before the 2008-2009 season, the Warriors signed Biedrins to a six-year, $63 million contract. He had a breakout season in 2008-2009 when he averaged 11.9 points, 11.2 rebounds, and 1.5 blocks on 57.8 percent shooting in 30 minutes per game. Back then, Biedrins was confident and active both offensively and defensively. He showed off his great defense when he blocked shots, covered the whole floor, and in pick-and-roll situations. The Warriors thought they had found the center of their future. However, Biedrins started to embark on his downward spiral during the 2009-2010 season. He shot a career-low 16 percent on free throws that season and only attempted 25 free throws. Because of Biedrins’ lack of success at the free throw line, he appeared to not want the ball as much, because opposing teams would just foul him to prevent him from getting off a good shot. This shook Biedrins’ confidence so hard that it doesn’t like he ever recovered. Biedrins also suffered many injuries throughout his career that slowed his progression in becoming more of a confident player again. Biedrins only played 33 games in the 2009-2010 season because of back and groin injuries. When Keith Smart took over the head coaching job for the Warriors in the 2010-2011 season, Biedrins had another opportunity to regain some confidence and play like his old self. He started off the season well, but, unfortunately, was hit by injuries again. Despite the potential and the talent that Biedrins showed early on his career, he has become a permanent end-of-the-bench player for the Warriors. This past season, Biedrins came into games just to provide extra fouls and to play garbage minutes in games that had already been decided. Because of his new role, it seems unlikely that Biedrins would step up next season if given the opportunity to. Biedrins has been in similar situations before where he has had the opportunity to start or provide valuable, effective minutes off the bench. Bogut was injured at the beginning of the season, so Biedrins had the opportunity to start the season at center and ultimately become the backup center for the Warriors. Before last season started, every player on the Warriors showed up early to Oakland, before training camp even started. Except for one. Biedrins ultimately lost the backup center job to Ezeli, not just because he was working out on his own before camp, but also because Ezeli was able to learn the system before Biedrins got there. “At the end of the day, everybody else was here, so that was the concern–putting in principles, putting in ideas, putting in plays, competing, the comraderie. That was the issue,” Mark Jackson said about Biedrins not coming to training camp early. Biedrins also shows a tentativeness in games that he doesn’t show in practice. The pressure of an actual game and the fear of disapproval by the fans clouds Biedrins’ thought process during a game. He often works out in the offseason with Utah Jazz center Al Jefferson, who claims that Biedrins is a completely different player during their practice sessions. He claims that Biedrins attacks the hoop more, uses spin moves, and shows his explosiveness. Jefferson has advised Biedrins to act like he is guarding him during games, which would hopefully make Biedrins more comfortable and not second guess himself. The only way that Biedrins can try get back to his old self is to regain his confidence. His fear of getting fouled and having to shoot free throws changes everything about how he approaches a game. Biedrins becomes absent on offense because he fears contact so much. Because of this, he doesn’t post up as much, he’s not as comfortable in pick-and-rolls, and the Warriors essentially end up having to play offense with just four players. On defense, Biedrins still displays his athleticism, his ability to block shots, his footwork, his high level of activity, and his ability to help his teammates. Although he can end up fouling too much, Biedrins needs to channel that same energy he shows on defense in his entire game. He can attempt to get back to the same player he was a few seasons ago, but, as mentioned before, it all comes down to his confidence. If Biedrins can find a way to regain some confidence and play in games with the same energy he has in practice, then he can start to get back to the player he used to be. However, it’s unlikely that he can get back there in just one offseason. It will take a couple solid seasons for him to feel like his old self. Because of this, it’s unlikely he will step up significantly next season, but he can at least start to regain his old form and contribute to the team in any way he can, especially because his team might need him to if Ezeli and Bogut are out.